Does anything say “Summer” better than a Lemonade Stand? The ladies at Paper & Cake recently shared with me their answer to the summer doldrums… a Lemonade Stand to beat all lemonade stands! What a great way to kick off our week of Summer Fun Giveaways! 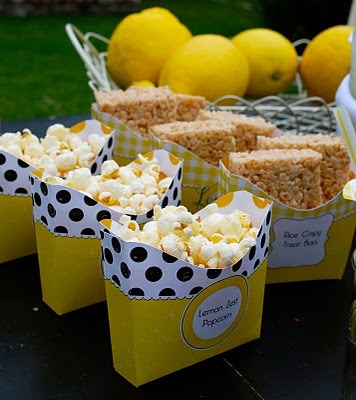 Of course, this kit would be great for a summer party, as well as a lemonade stand. 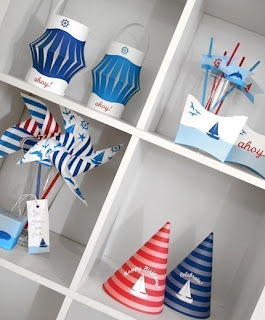 If you are looking for a different feel for your summer festivities, check out their Nautical-themed party set! will win your choice of ANY single item from the Paper & Cake shop. To enter, simply leave me a comment below and tell me if you or your children ever have made a lemonade stand. For a BONUS entry: visit the Paper & Cake shop and in a separate comment, tell me which party you would choose if you were one of the winners. Please make sure your email address is easily found in your comment or in your profile, so I can contact you if you win! I already follow their blow and they never disapoint. I love the lemonade and think it would be really cute for a baby shower too. These are so adorable. My little one is too young to have a lemonade stand – bet definitely will in the future! If I won I'd choose the Race Car Printable Birthday Party. I have Never had a lemonade stand. Can you believe that??? I am determined to have one with my boys when they get a little older! I never had a lemonade stand as a kid! I dont have children yet, but im sure when i have children we will have a lemonade stand, it looks so fun! If I win, I would pick the French Circus! It is PERFECT for my little boys 1st birthday! If I won, I'd choose the Lemonade printable party! My girls have actually done a lemonade stand a couple of times outside our house- after Halloween they had one and sold a bunch of their candy along with the lemonade and did pretty well! If they had that cool banner hanging above them I'm sure they could make a killing! My three kids all have done lemonade stands. Multiple times. Along with an apple cider stand, veggie stand, and even black walnuts! Our neighbors are kind and generous and have supported them throughout their "stand" careers. One summer, the whole crew of straw balers came and they got a $20 bill. Talk about memories. The funniest was last year when they remembered the black walnuts and laughed until they cried because they sold two bags for 75 cents a piece and were realizing that the neighbors supported them WAY BEYOND the norm. Or, the time when they charged $1 for 5 green beans. My kids are now 20, 18, and 16 and now stop at EVERY kid's stand and support them! I remember when I was little I had my dad build me a small table with something like a picture frame on top to serve as the "window" of the lemonade stand. I painted a sign myself that said lemonade 10 cents. I also sold fresh fruit like cherries, black berries, raspberries from our gardens that I picked myself. Too bad we lived on a farm and my only customers were my parents and my grandparent who lived next door. Oh and my dog haha. But its the memories that count and mean everything! Sadly I never made a lemonade stand. My cousin and I made and sold our own chocolates from door to door out of my grandma's wagon. The didn't taste very good but we had a blast. I would love the retro Hawaiian stuff. So much fun to be had with that. I would love the ocean life one or the space party so mauch great stuff!!! We have had a few lemonade stands but, never as cute as this one! I had a lemonaid stand as a kid and I always stop to buy some whenever I pass a stand. We are planning on doing a lemonade stand this summer so this would be perfect!! I think the lemonaid one looks good, espcially because it comes with a lemonaid recipe. My nephews just recently set up shop at the end of their driveway. They get a bunch of people going up an ddown the street and they love selling their lemonade. 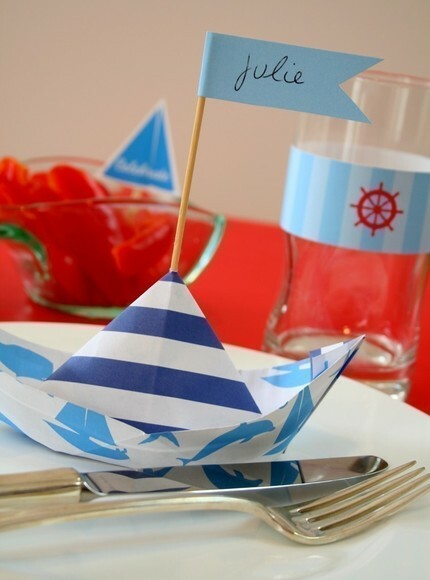 The Sail Away party is beyond cute. Haven't made a lemonade stand yet… but with a prize like that we'd do it in a heartbeat! No lemonade stands here but I am totally inspired! I would love the back to school kit, I am starting a preschool from home and this would be awesome! I used to have a lemonade stand growing up that my sisters and I would run every summer. When my kids get old enough I hope to pass the tradition on. I would probably choose the pirate printable birthday set, but I also really like the race car birthday set. I would love to have the Alice in Wonderland theme!! SO fun! I LOVE Paper & Cake!! I purchased their pirate party for my son's 5th bday and it turned out great! I'd like to purchase the bird's nest baby shower kit – it's beautiful! My son's been begging me to have a lemonade stand lately. This would be PERFECT!! Thanks for the giveaway! I was determined to have a lemonade stand as a child. Finally, after much naggin, my parents gave in. After being in business for all of two hours, I still had no customers. Turns out, having a lemonade stand on a busy street during afternoon rush hour is not ideal. To this day, I stop by every lemonade stand I pass. That's tough work! Oh my goodness – so fun! I love everything she does!! I would love that lemonade kit. I will put it on my sidebar! New follower. My children have never made a lemonade stand. my kids love having a lemonade stand ( of course, we won't have one again until fall because it is TOO hot here in the summer!) 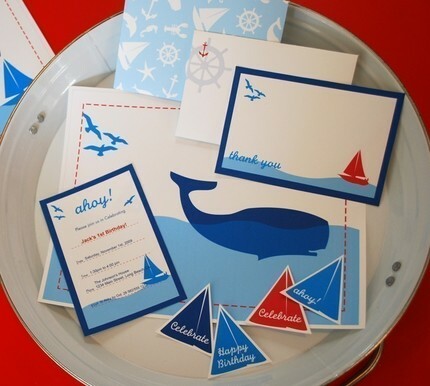 love paper & cake-they have such cute printable designs! We love to have lemonade stands! We are going to do some this summer at our house and grandma's to raise money for SGK 3 Day. I love their products! My fav is the lemonade stand. So cute! my kids love setting up stands in the front yard! Last summer they set up a beauty shop, and art gallery. Usually their only customer is Grandma who lives 2 doors down, but they have fun. They keep asking me to have a lemonade stand, maybe we'll have to try it this year. I haven't had one with my daughter but I remember having them when little. We have little neighbors set them up all the time and they always make me smile. These are gorgeous!!! I am so glad you featured them, I love how complete their sets are. No thinking involved. The Lemonaide Stand is my favorite but if I won I'd probably get the Fairy Wonderland Printable Birthday Party. I can think of one little one who'd love it! No lemonade stand yet, my children are to young, however we have purchased from many! I would Love to win. That is the cutest lemonade stand ever!! My boys have never done a lemonade stand only snowcones. They would love it. I would still choose the lemonade stand, but I love the back to school package too. I currently live in the country, so my children have never had the opportunity to make a lemonade stand, but my friends & I used to make one every summer when we were kids. 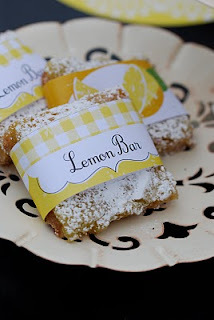 I would love to use the Lemonade Stand party kit for a fun summer party or for one of my MOPS gatherings. Such a cute giveaway. All are so adorabel but I would probablly choose the lemonade. We have never made a lemonade stand, but the kids have asked. I'm waiting for them to get a little older. No lemonade stand yet-but soon!! This would be perfect for their first one! Very tough choice-but I'm leaning toward Alice & wonderland unbirthday set-wouldn't that be a great impromtu party?! We were just talking about doing a lemonade stand today! This would be perfect! My son has done a couple of lemonade stands, actually. Loves them. He's 10 and would do one every day if he could. LOVES talking to people!!! I once made a Kool-aid stand, but I think we ended up just drinking it all! I love seeing kids with lemonade stands, I'm always sure to buy a cup full. I did a kool aid stand when I was little and was very unsuccessful. But me and my siblings did have a lot of fun drinking all that kool aid! I love all the fun boy set, the camo, pirates, cars….. I love her game day set. Makes me think of my boys! After thinking over childhood memories…I can't think of once that I had a lemonade stand. Definately have to make it a memory for my girls! I love the lemonade idea. 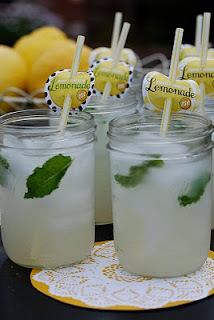 We love lemonade in the summer and I love all the other ideas to go with it. My kids are too young still, but I was thinking of having a lemonade stand at our garage sale and what a cute stand! I would probably choose the lemonade, but my 3year old loves pirates, but I don't know. So many cute choices to choose from. We have never had a lemonade stand. Only bake sales experience for me. I remember my sister and I having a lemonade stand when we were little…but I can't say it was much of a success!! Maybe one day, my daughter will have her own! I would choose the Lavender and Toile Printable Baby Shower kit!! It's gorgeous and would look amazing for my friend's baby shower that I'm hosting in September! !